If you are tired of changing so many humidifier filters every season and wish you could get one that can be washed, cleaned and reused over and over again, you have found the right product! This humidifier filter is made of Dura-ester, not paper anymore. Dura-ester is a durable synthetic polymer that draws water quickly yet resists calcification and algae. When it gets dirty it can be regenerated simply by washing with cold water and soap. See picture in Images. Depending on the hardness of the water used in the humidifier and other factors (for example, temperature, use of algaecide, etc. ), this filter can last five to twelve times longer than conventional disposable ones. It will pay for itself in no time! Compatible with: Holmes HWF65 HWF65CS "C Filter", Bionaire BWF-65, Sunbeam SF206 HF206 "C Filter", Honeywell HC-15 HC-15N "F Filter"
Works with Holmes models:HM1800, HM1840, HM1845, HM1850, HM1851, HM1855, HM1865, HM1888, HM1889, HM1895, HM1975, HM2059, HM2060W, HM2090, HM3000, HM3800, HM3850, HM7600, and HM4000; Sunbeam models:SCM1866, SCM1896 and SCM1896. 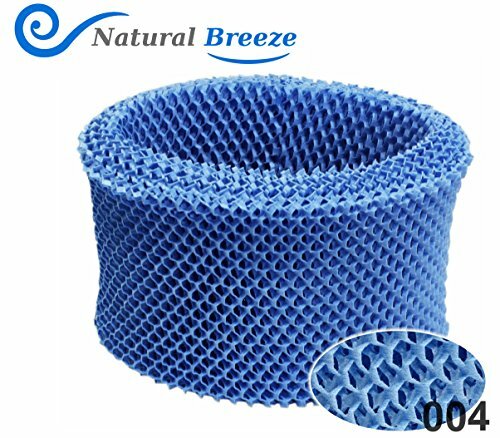 If you need help finding a Natural Breeze replacement filter wick for your humidifier, please contact us. If you are not satisfied with the filter, return it within 30 days for a refund of the purchase price, no question asked!